What causes breast cancer? What is the relationship between breast cancer and estrogen? One cause is the proliferation of environmental estrogens that are not natural to the body. Because radiation can also cause cancer, the new mammogram guidelines in all likelihood would reduce the risk of breast cancer. I wrote this web page because of the recent concern about revised guidelines for mammograms. Women are very concerned and confused by this change and so I wanted to address this issue, and also the issue of breast cancer and estrogen. Some women feel that this is part of a cutting back in funding for breast cancer detection and treatment that may be part the new health care bill being debated in congress. I don’t know what politicians are thinking, but I will try to address this concern and suggest steps to deal with it. What causes breast cancer is not lack of screening, but rather a lack of knowledge about prevention. 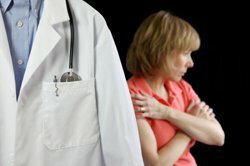 The new proposed mammogram guidelines are based on statistics that show that for every 2,000 women that get mammograms there would be one life saved by this early detection, but 20 false positives that would expose the women to unnecessary cancer treatment such as radiation and or chemotherapy. By starting mammograms at age 50 instead, only one additional life would be lost to breast cancer, but 20 false positives eliminated, sparing the 20 women the suffering of undergoing standard cancer treatment (radiation and/or chemo). This is based on statistical analysis, but if you are the one woman who is impacted by an undetected cancer, then it is no longer about statistics, but about your life. However as I will explain, there is another way to look at these new mammogram guidelines, and a course of action that can help increase the odds in your favor. Knowing what causes breast cancer will help you prevent it. When getting mammograms or being treated with radiation, protect yourself with good nutrition by increasing your intake of antioxidant foods and liquid antioxidants in supplement form because they are better absorbed by your body. The precise answer to this questions is not known. The short simple answer is DNA changes brought on by abnormal cellular homeostasis. Actually there are many factors, but are all related and can all be addressed by doing certain things, some of which you probably have not been told about! Breasts are made up of fatty tissues, and fat is where toxins in the body are stored. Therefore if you have toxins from heavy metals, or environmental chemicals, your breasts will be affected. Xeno-estrogens, the same hormones that increase the risk of breast cancer also causes the type of cancer that men fear the most, prostate cancer. Estrogen has a known role in stimulating increased cell division in breast tissues. It can also affect other hormones that have a stimulating effect on cell division as well. Synthetic estrogens seem to be more of a problem in this regard, which "may" be an argument for a possible "protective effect" of bioidentical estrogen! In addition, please note that elevated insulin levels (insulin is a growth hormone that also encourages cell division) will put you at increased risk for cancer of the breast. Radiation from mammograms and other forms of radiographic screening like chest x-rays, ect., can also result in increased risk for breast cancer, because they create high levels of free radicals that damage DNA. This is again because the fatty tissues of the breasts are very delicate structures and easily affected by free radicals that are generated by toxins and radiation. Ionizing radiation (from x-rays and mammograms) can also cause breast cancer. With the new mammography guidelines, the silver lining so to speak may well be that women are exposed to much less radiation over time because they would be starting mammograms at age 50 instead of 40. This will result in less breast cancer not more! The one additional (statistical) death per 2,000 women may not even occur! Also, if you add in the lifestyle changes, nutrition, and use of methyl donors that I will discuss on this page, there should be a significant drop in breast cancer due to the new guidelines if they are adopted. Breast tissue is estrogen sensitive, just as is the male prostate gland. Cancer can be triggered by abnormally high estrogen levels in both the breasts AND prostate. Synthetic estrogens and xenoestrogens (environmental estrogens) significantly increase your chances of getting breast cancer. This is why synthetic estrogen therapy has been halted by mainstream medicine, and women affected by breast cancer have part of large class action lawsuits against major pharmaceutical companies who make and market these synthetic hormones. If you are considering estrogen therapy and it is a medical necessity, then you need to read Suzanne Somers books regarding bioidentical hormone therapy. Susan is a breast cancer survivor, and although many doctors do not like her because they are not used to a woman without medical training speaking out on breast cancer, she speaks from personal experience, which of course male doctors will never have! Ok, now we’ve delved into what causes breast cancer and the relationship between breast cancer and estrogen, we know that synthetic estrogens, and environmental estrogens are bad, but what do we do? Please understand that nothing I am going to suggest to you somehow guarantees that you will never get cancer, but what I will tell you is that is will certainly lessen the chances that you will get cancer, and that is well worth the effort. If you know what causes breast cancer, you can take very effective steps to prevent it. The information about the MTFHR gene is especially important, because that is where the issue of “family history” that you hear so much about comes into play! Eat a healthy diet which means…. Note: If you do eat red meat, make it organic (no estrogens) and free range (less fat). Always buy organic products to avoid hormones in pesticides and other chemicals. Wow….was that list long enough? Sorry, but I wanted to include everything I could think of about what causes breast cancer and how to prevent it and not leave something potentially important out. Ok, I know the above list seems long and complicated, but it isn’t meant to be a daily checklist of things you must do. Rather it is a collection of strategies that you can and should gradually implement in your life not only to protect against breast cancer, but to live a healthier happier life as well. What causes breast cancer? DNA damage from all the toxic aspects of our modern industrial life! The list above shows strategies for normalizing our lives to what they were meant to be. The side benefits are better overall health and more enjoyment of life. You can prevent and if need be fight this disease. I have just given you some important information, but you have to take responsibility for your own health, and empower yourself. Please note that none of the information on this web page is being promoted as a cure for breast cancer. It is intended to provide you with information that will help you make better decisions about how to minimize your risk of breast cancer. I do not have a financial interest in any specific nutritional product mentioned on this page.